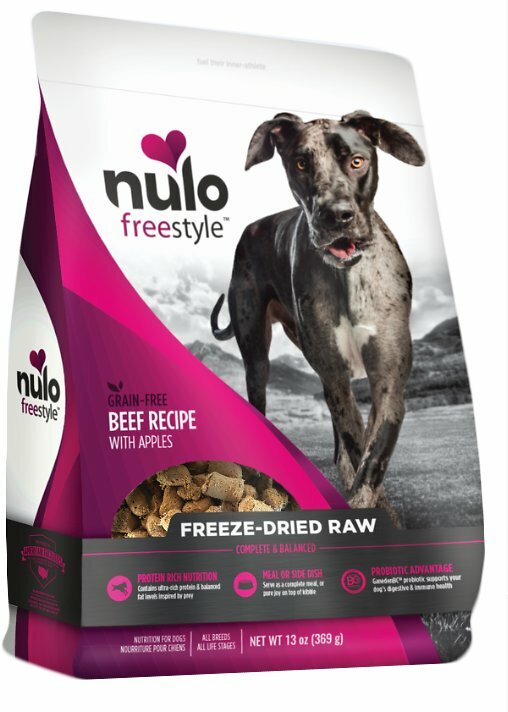 Give your pooch the raw, prey-inspired nutrition he thrives on with the Nulo Freestyle Grain-Free Beef Recipe With Apples Freeze-Dried Raw Dog Food. It’s all the benefits of raw without the hassle, containing 83% beef, organs and bone for the ultra-rich protein and balanced fat your pal needs to feel and look his best, plus fruits and veggies like broccoli, parsley, and apple. It also has GanedenBC30, a powerful probiotic, or “good bacteria” that supports your dog's digestive and immune health with every bite. These irresistible morsels are minimally-processed and quickly frozen to lock in the most nutrients and flavors. Plus, it’s made with no corn, wheat, soy, artificial preservatives, colors or flavorings. Provides a high-protein and fat-balanced diet with 83% beef, organs and bone, plus broccoli, parsley, and apple. Our Malshi loves freeze dried morsels. We ordered this in Salmon and Beef flavors in one autoship. These little bags last a long time for us surprisingly. Well we finally got to the beef one but unfortunately he didn't take a liking to it. He loves the Salmon one so we'll order that one for sure. Great ingredients overall, this flavor just wasn't a hit sadly. This is a quality food, made well I assume. Our dog likes it just ok and for us it’s such a hustle since the pieces are so hard that it’s very difficult to break them in order to add water. I feel it just doesn’t justify the price and I know I won’t buy it again but can’t say I won’t recommend others since if you don’t care about that you might enjoy it. I used to add canned dog food to my dogs kibble but it is so expensive. This is freeze dried so it does not take up much room in the cupboard. I place a few pieces on top of their kibble. My dogs love it. More affordable than canned dog food. 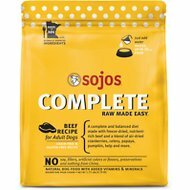 I wanted to introduce raw food into my dogs diet. I can not believe how much they love this food!! My one dog...she is so picky...but she go's nuts over this stuff. Only complaint is its so expensive. I can only afford to give them once and a while. But I will be buying this again!!! Got this for my "picky" eater pup. He loves it! It is one of the few foods he will eat. I recommend it to anyone with a picky eater like mine! 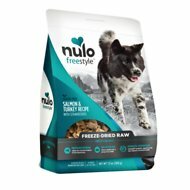 I've been looking for something smaller in size for my small breeds that mirror Orijen's quality of good foods, Nulo is a great brand! Instinct was a brand I was looking to purchase, but it just didn't seem a high quality, even though it was in the same price bracket. 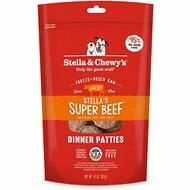 This stuff is great sprinkled on their freeze dried kibble. We have a picky Dane Puppy. These are great to rub in your fingers and create a crumble to mix with kibble to entice your pup to eat!